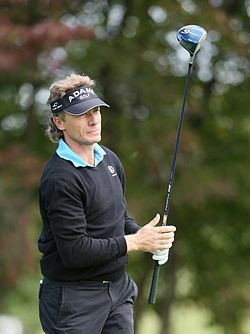 Bernhard Langer ([ˈbɛʁnhaʁt ˈlaŋɐ]; born 27 August 1957) is a German professional golfer. He is a two-time Masters champion and was one of the world's leading golfers throughout the 1980s and 1990s. In 1986, he became the sport's first official number one ranked player following the creation of the OWGR. Langer is one of five golfers who have won professional golf events on all six continents where golf is played. He has victories on all the premiere tours, with 42 wins on the European Tour (2nd most all-time), three on the PGA Tour, and numerous international victories; including wins on the Japan Golf Tour, Asian Tour, Australasian Tour, and the Tour de las Américas. The highlights of Langer's career are his two major championships. His first major win came at the 1985 Masters Tournament, where Langer won by two strokes over runners-up Seve Ballesteros, Raymond Floyd and Curtis Strange. His second major came at the 1993 Masters Tournament with a four-shot victory over Chip Beck. Langer has also finished runner-up on two occasions at The Open Championship (1981 and 1984). After turning 50, Langer has established himself as one of the most successful players on PGA Tour Champions and has won a record 10 senior major championships and achieved the career Senior Grand Slam (winning each of the five major championships at least once during one's career). He has won the 2010, 2014 and 2017 Senior Open Championship, the 2010 U.S. Senior Open, the 2016 and 2017 Regions Tradition, the 2014, 2015 and 2016 Constellation Senior Players Championship, and the 2017 Senior PGA Championship. In the senior majors, Langer has competed in 48 events and has finished in the top-5 and top-10 in 24 (50%) and 38 (79%) of them, respectively. Langer was born in the village of Anhausen, which today is a part of Diedorf municipality, near Augsburg, Bavaria, Germany. He turned professional in 1972 and has won many events in Europe and the United States, including The Masters in 1985 and 1993. He was the inaugural World Number 1 when the Official World Golf Rankings were introduced in 1986. He was elected to the World Golf Hall of Fame in 2001 (but deferred his induction until 2002). He ranks second in career wins on the European Tour (42) and has also played regularly on the U.S.-based PGA Tour, especially in the late 1980s and since 2000. He finished in a tie for fifth at The Open Championship the month before he turned 48, and regained a ranking in the top 100 three months before he turned 50. Along with Gary Player, David Graham, Hale Irwin and Justin Rose, Langer is one of only five players to have won official tournaments on all six continents on which golf is played. He played on 10 Ryder Cup teams (1981, 1983, 1985, 1987, 1989, 1991, 1993, 1995, 1997, 2002) and was the non-playing captain of the victorious European team in 2004. In 2016, Langer claimed the Regions Tradition title for his sixth senior major championship. He won by a six stroke margin over Olin Browne. This was his 100th professional win and the first time Langer had won the title. His capture of the 2017 Senior PGA Championship completed a career Grand Slam. The Regions Tradition title had also made him only the second golfer, after Jack Nicklaus, with wins in four different senior major championships. Later in 2016 he wrote history by becoming the first three-time winner of the Constellation Senior Players Championship and wins it for third straight year. The result also meant that only Nicklaus had won more senior majors than Langer. In November, he won his fourth Charles Schwab Cup and his third in a row. In January 2017, US president Donald Trump used a incorrect story about Langer's failed attempt at voting in the United States to justify an investigation of voter fraud in the 2016 US presidential election. The story was covered in several media outlets. Since Langer is a citizen only of Germany, he was not eligible to vote. Langer won three more senior majors in 2017 to become the most decorated player in the senior ranks of all-time. In total, he won seven titles – but he did not win the season-ending Schwab Cup. Instead, Kevin Sutherland, who was fifth in the Order of Merit heading into the final event of the season, won that to lift the trophy in what was his only win of the season. Langer subsequently called the playoff process 'unfair'. Langer's total career earnings up to 2018 on the PGA Tour and PGA Tour Champions were more than US$36 million. In September 2018, Langer received the Payne Stewart Award. In November 2018, Langer won his fifth Charles Schwab Cup. This brought his lifetime earnings in the Charles Schwab Cup to $7,000,000. Note: The U.S. senior tour was known as the Champions Tour during Langer's first nine seasons on that circuit (2007–2015). The PGA Tour rebranded the senior circuit as PGA Tour Champions effective with the 2016 season. 18 21 Apr 2013 Greater Gwinnett Championship 73-66-67=206 −10 3 strokes Tom Lehman, Tom Pernice, Jr.
* Tournament shortened to 36 holes due to weather. * The U.S. Senior Open and Senior PGA Championship are unofficial money events on the European Senior Tour. Note: The Senior Open Championship and the U.S. Senior Open are both co-sanctioned events by PGA Tour Champions and the European Senior Tour. ^ "Bernhard Langer Offizielle Homepage". Bernhard Langer Offizielle Homepage. Retrieved 2016-07-17. ^ "Meldung 17 07 2016". www.hall-of-fame-sport.de. Retrieved 2016-07-17. ^ "Pros hail 'incredible' Bernhard Langer". bunkered. 9 April 2016. ^ "Golfer Bernhard Langer reportedly sparked Trump's unsubstantiated voter fraud claims". www.cnbc.com. Retrieved 2017-02-05. ^ "Bernhard Langer blames media for Trump report". www.usatoday.com. Retrieved 2017-02-05. ^ "Who Is Bernhard Langer?". www.nytimes.com. Retrieved 2017-02-05. ^ "Bernhard Langer clarifies role in Trump story alleging voter fraud". news.go.com. Retrieved 2017-02-05. ^ "German golfer Bernhard Langer disputes President Trump's story about unfounded voter fraud". www.washingtonpost.com. Retrieved 2017-02-05. ^ "German golfer Bernhard Langer: Voter fraud story used by Trump misconstrued". www.cbssports.com. Retrieved 2017-02-05. ^ "Trump's Voter Fraud Example? A Troubled Tale With Bernhard Langer". www.nytimes.com. Retrieved 2017-02-05. ^ Inglis, Martin (13 November 2017). "Bernhard Langer critical of 'unfair' Schwab Cup". bunkered. ^ "All Time Money Leaders". PGA Tour. Retrieved 23 May 2018. ^ "Langer honored with PGA Tour's 2018 Payne Stewart Award presented by Southern Company". PGA Tour. 20 August 2018. Wikimedia Commons has media related to Bernhard Langer.